Sleepwalking Stories...: Home Alone? : Wipe the floor! All you need is an old bucket, a piece of old clean cloth, water and a Sunday afternoon. The cloth is usually the dress you wore on your third birthday or a piece of a discarded curtain. 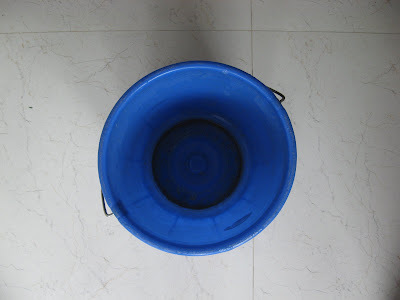 Now collect water in a small bucket and dip the cloth-piece in it. Strangle it savagely to a non-dripping wetness. Now bend down and start wiping the floor from a end or corner, such that you are always moving away from the wiped area. Go on - Wipe! Wipe!Wipe! Let your reflection show on the tiled floor. Use your arms to cover every inch - Under the cupboard, the refrigerator,the TV stand. Occasionally you may encounter spiders, lizards, baby cockroaches and other denizens of the insect world, who will be as afraid as you will be of them. Let them be. Killing them doesn't make the floor any cleaner. Please note: After wiping a room, dip the cloth in the bucket, wring the cloth of all dirt and begin again. Happy wiping!